Workshops - McNeil Consulting Inc.
Learning how to facilitate Meeting Designs will dramatically improve your ability to aid teams in discovering how they can take actions that will move them to higher levels of performance. McNeil Consultants Inc. is offering to train internal consultants in the Advanced Facilitation Laboratory. The Laboratory Experience is a unique developmental approach that emphasizes immersion in the very meeting design techniques the participants learn in this program. Participants engage each other through presenting, designing, and experimenting throughout the experience. They enhance their consulting skills by practicing advanced techniques to help groups and teams to make use of action research designs that are critical in strategic planning, team building, executive coaching, feedback, innovation, and project management. Robert and Christine McNeil’s e-book, Moving Experiences: 26 Great Designs Every Facilitator Must Know is used in this workshop. High-level meeting facilitation is a complex skill. It is learned through repeated practice over time. This workshop delivers a solid foundation on which the participant can build a practice. The exercises are taught through the concept of design so that the principles learned can be applied in a variety of settings. The return on your investment comes from increased team performance and strategy execution. If you can meet better than your competition, you generate better ideas and you implement those better ideas more quickly, and at a lowered cost. We have seen the real value returned over and over again by investing in your high potential leaders and developing their skills for designing, convening, and facilitating critical meetings. As the leaders use the skills and designs learned in the program, you can expect higher engagement at meetings and more alignment and commitment to results. Value can be measured by more interaction, better decision making, more risk taking, increased innovation, increased trust, lower costs, and increased speed from actions to results. 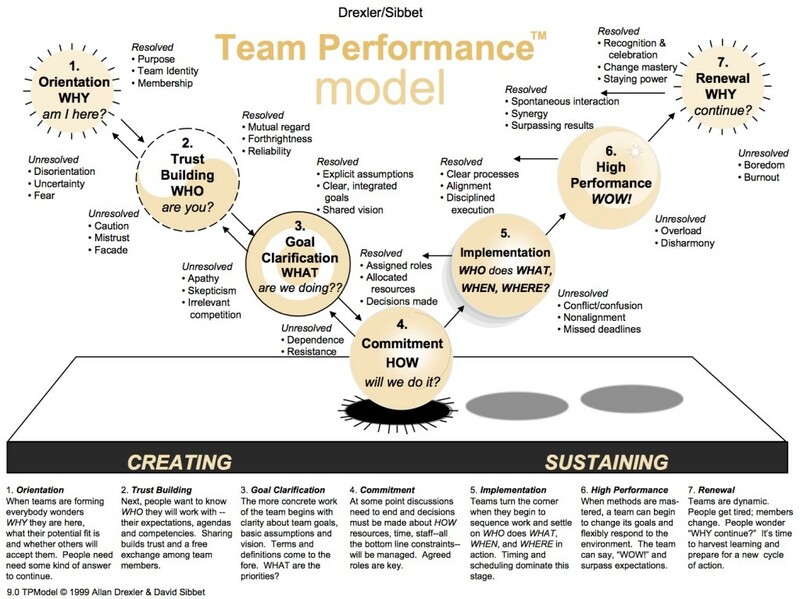 Our program will certify team leaders, HR business partners and OE consultants in the use and application of the Drexler Sibbet Team Performance System. The participants will learn how to work with the array of tools and techniques for working with teams throughout their organizations. At the start of the program, each consultant will be given access to the Web-based electronic versions of the tools for working with teams. This includes access to the model, the survey, and the “Practices” for team development. They will learn how to download the tools they will need and be certified in their use. The Workshop Phase of the program consists of a three-day learning and practice session. The consultants will learn how to gain entry to the team, contract with the team leader and the team, and offer the services the team wants and needs. They will learn which tools to choose for their work as well as how to do a thorough team assessment using the Drexler Sibbet Team Performance Survey. Additionally, they will learn how to design, facilitate and debrief robust team building interventions using the team survey and the tools available in the system. Following the three-day workshop, an option can be chosen where the participants can enter into a Practicum Process where they will consult to an actual team while working in pairs or individually. It might be a team that is starting up, a healthy team that wants to improve its performance or a team that needs a performance “tune-up.” The pair or individual consultants will gain entry, describe their offer and sell their internal consulting project to the team with whom they choose to work. We have allotted ninety days for all of this work to be completed by the consulting pairs. At the end of the ninety-day Practicum Process, we will convene a Team Consulting Clinic where each pair or individual will present their work and their results to their colleagues for critique and feedback and will receive their certification based upon their completion of the program. We will also celebrate their accomplishments and discuss their learnings at this session. The sponsors of this project will be invited at the end of this clinic to hear the success stories, and the value created through this team building and skill building session. A small group of highly-networked team consultants can create a groundswell of positive energy, collaboration, and cooperation in your organization. As they consult with start-up teams and project teams, they will be contributing by increasing trust and innovation system-wide. All of this work can transfer to lower costs and better margins. Real team building always pays for itself over and over again. When people learn to work better together, they stay longer, they learn together, and they opt for high performance. We have seen this happen over and over again. A cadre of certified consultants for teams builds a virtuous circle where good work is followed by positive feedback, calculated risk-taking, and increased innovation. As teams learn how to achieve high performance earlier and sustain it longer, their members learn how to function together as an ideal team. The certified team resource creates the ability for people and teams to combine and recombine in all the ways necessary to achieve extraordinary performance gains. We will send along the program budget, outline an agenda if you decide to move forward. We will meet with you to finalize our program design before the start of this work. Fast feedback cycles at table groups. This Advanced Consulting Skills Program is designed to create a community of practice focused on developing the skills for internal consultants. It is a deeply personal program that extends over a 6-month period. Participant consultants will complete rigorous assessments of themselves, consult and coach each other, facilitate sessions, and actively contribute to the overall experience of the other members of the community. The true value in creating a cadre of highly trained internal consultants will be an increased demand for “seats at the table” for HR and OE professionals. Being true business partners means bringing to the conversation reflective planning and execution. The internal consultants will help their clients hear from all the voices on the planning end and speed up critical conversations, debriefs, and course corrections. Internal HR and OE consultants will be able to design and facilitate strategic off-sites allowing the GMs and business leaders the ability to attend their own meeting without having to concern themselves with facilitating conversations while trying to influence outcomes. This clarity of roles enables conversations to go deeper, issues to be raised earlier, and conflict to be managed effectively. The results are better decisions founded in evidence where biases are discovered and checked. Internal consultants skilled in Organization Development techniques and methods will also become resources to the group to increase participation, work through resistance, and align groups on complex projects. They can also offer the means to help business partners take a systems view of their product and services. Their training in publishing data in creative ways and helping teams and groups to understand their findings translates into better business decisions with more alignment and commitment of those charged with carrying out the decision. This program will focus on the consultant’s work from the inside out. Instrumentation, self discovery, skill practice, and feedback will all play significant parts in this program. Authenticity and integrity in contracting for the consulting work will be emphasized. Consultants will practice building solid client relationships by focusing on connecting to “active listening” to what the client wants and matching it with what the client can deliver. Each consultant will demonstrate his and her ability to apply action research methodologies and technologies in this program. Action Research Consulting always engenders “resistance.” It can take many forms from passivity to active opposition. Through case studies, role plays, and reviews of actual work, the consultants will learn to see resistance and how best to surface it and work productively with it. Owning the data and working with the results of the findings are the client’s responsibilities. The consultants will practice techniques for presenting data clearly and cleanly. They will learn how to encourage their clients to accept their current reality, speak to each other forthrightly, and plan together creative ways to move forward towards their desired end result. Consultants are tasked with describing their proposed interventions, detailing their designs, offering rationales for using certain methods and techniques, and summarizing their results. The participants will practice their writing skills in a variety of forms. They will critique their proposals, share written observations, take notes on flip charts, and practice creating short illustrations and metaphors for action. Often consultants must intervene in positive and productive ways to facilitate an effective group process. Whether this is stopping the action, using a “teachable moment,” or taking a time out to do individual coaching with a participant or leader, the consultant must be aware on many levels. Practicing “staying present and focused” will be emphasized. The ability to describe data, issues, difficulties, and opportunities are critical competencies for consultants. This program will emphasize how to present data dispassionately and how to work with feedback non-defensively. Central to this work are the self-reflections necessary to remain authentic and present. Skill practice with actual client work, instrumentation, and live feedback from the other consultants are built into this program. This session will be followed by a hands-on practicum process where the participants are paired and will be charged with finding an internal client. They will engage a client, complete a real project, reflect on their progress, and write a final report. Each pair of consultants will present their work for critique from their colleagues and receive feedback at a Consulting Clinic. Leading in today’s fast-paced and ever-changing environment takes courage. The journey begins with increasing the leader’s self-knowledge through individual and group work. The individual work is done with the leadership coach; the group work is done in the context of the leader’s team, the matrix, and the organization. We help managers to become reflective practitioners as they practice the requirements of leading others. Leaders have to manage the paradox of working on themselves while working in and on their teams. Specifically we help leaders to develop a diagnostic mentality that combines curiosity with rigorous testing. In addition to becoming more aware of how to communicate more effectively and behave differently, we help leaders learn a series of unique and specific skills that build upon each other and increase ones effectiveness. The Leadership Fundamentals Workshop is conducted as a five-day intensive workshop. Meetings are scheduled periodically with homework in-between each meeting. Participants are encouraged to practice applying the skills with the other participants and back on the job. We offer the workshop as a five-day intensive experience delivered over the course of three months. The leaders learn new skills and practice them. They discuss their experiences in applying the skills and refine those skills that need extra attention. Individual consultation is also available between each session. Often, Senior Executives are invited to the workshop to offer insight and perspective in applying the skills in the office environment. All experiences in the workshop are voluntary. The scheduling for this workshop is flexible. Contracting includes working out a schedule that fits the needs of the participants.